The best way to save your sanity is to teach your kids the art of being organized from very beginning. In this regard, one of the rooms in any home that can get out of control is the bathroom. Things like lotions, toothpastes and brushes and towels can easily scatter over the expensive countertops and create clutter. Organize your bathroom with these simple bathroom organization tips and the same room that gave you anxiety can be relaxing area. Following lines explain how you can make your family stay organized by following simple storage techniques in the bathroom. Dirty laundry and towel can easily convert your well designed bathroom into an eye sore. Therefore, if you install a laundry hamper inside the washroom, your spouse, children and you yourself can present no excuse when it comes to cleaning and clearing things. In addition with laundry and towels, you should also conceal other unattractive items such as toothbrushes and the best way to do so is to place small baskets on the shelves. 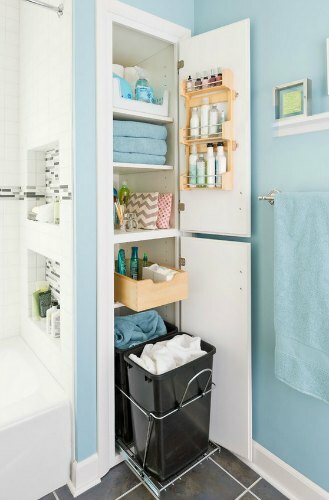 This will also provide extra storage to you making your bathroom clutter free and more organized. If your bathroom is devoid of any storage space, you should consider placing an open-shelf cabinet in the bathroom. You can easily keep washable clothes and similar things in the lower shelves. Use upper shelves to place things that you want to keep out of reach of tiny hands. 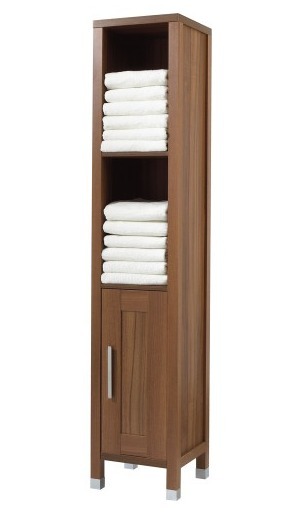 The photo below shows another great option for a bathroom storage unit from http://www.bathandshower.com/ with open shelving on top for pretty things like towels and closed cabinet drawers for things you may not want as visible. A magazine rack installed directly above the tank of the toilet can totally transform your dull bathroom into something spectacular. It will give the room a cleaner look by freeing up the space above the tanks making your bathroom look spacious. Small items like hairbrushes, pins, curling irons and hair dryers can really tangle things up and cover a lot of storage area. In order to overcome the problem, it is a great idea to allocate a section to each item within the same cabinet. If you cannot spend too much on remodeling your existing cabinet, consider using plastic boxes within the drawers to get the same functionality. Soap and other bath items are also very challenging to store properly in the bathroom. Therefore, keeping them right above the tub is the perfect storing solution as it will not only make bathroom cleaner, you can easily access them while you are bathing. These small items are most difficult to be contained properly and are often very difficult to be found when needed. Therefore, if you are lucky enough to have a closet in your bathroom then why not use plastic over-the-door shoe organizer. It will make your items easily visible and accessible whenever you need them. However, never forget to store medicines out of the reach of children. Finally you should store the items you most frequently use in glass jars placed over countertops. They will not only serve the decoration purpose but will always be in easy reach as well. 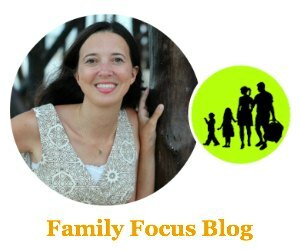 I hope you find these tips helpful to organize your bathroom and in turn help you to teach your family how to live a focused and organized life. I need a white linen cabinet that is tall, and 13 ” wide. Can’t find one anywhere. Needs doors! Help!! !